Working on techpacks can be a grind. So much time is wasted on mindless repetition. Changing tiny details over and over again. Adding the same design info season after season…tech pack after tech pack. What if you could reuse any design detail with one simple drag of the mouse? It’s the most intuitive way for you to store and reuse all your design details. This includes sketches, materials, measurements - along with their related images, annotations, comments and files. Like the name implies, the Card Library stores Cards. Each Card represents a single design detail such as a logo, pattern, fabric, label, point of measurement etc. Think of them as lego blocks that you can reuse and build different objects. The Card Library saves you from repetitive, soul-crushing tasks. Want to reuse a design detail on multiple tech packs? Let’s see how it’s done. All you have to do is drag your Card from your Library and drop it into your Techpack. You won’t ever have to recreate anything from scratch. How about sharing a design detail with a team member? Same thing. Simply drag the Card into your Organization Library for everyone to use. The best part of the Card Library? It’s actually useful. It reduces your work instead of adding to it. You won’t have to learn anything new. Your teammates will thank you for it. They will use it All.The.Time. Try out the Card Library by signing up for a free 7-day trial. It’s the perfect tool to work on entire fashion collections. Say you want to replace normal zippers with custom zippers with your logo on them across your entire collection. All you have to do is simply create a Card for these new zippers, save into your library and drag them on each tech packs board. Here's a quick video on how to add cards on Techpacker. It makes your designs consistent. You can turn your spec tables into templates, save them in your Library and reuse them in one click. Rest easy knowing that no matter which style your team members are working on; sizing and measurements will always remain consistent across the entire collection. Learn more about Measurement Templates. It brings your team order and clarity. The Card Library creates a common language, a single source of truth for your team, your manufacturer - heck your entire supply chain. If new teammates join in: design details, artworks, materials and grading rules will all be laid out for them to get up to speed and start right away. ❑ Revamp your popular styles fast: You can reuse design details and edit your tech packs quickly. Re-cut your successful styles midseason for quick production runs. 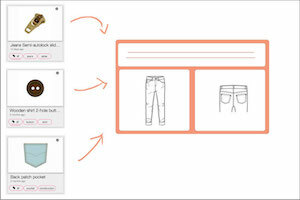 ❑ Develop samples on the fly: It gives you the building blocks to test ideas, iterate, identify mistakes and ultimately - create fashion products better and faster. ❑ Find any design detail: Tag any of your Techpack or Card with keywords. Search for them using filters. Discover how. ❑ Revisit your old work: Every style, collection or piece can be archived. Nothing is lost or deleted - everything is there whenever you need it. Now, how about you give it a try? Signing up for a free trial now!